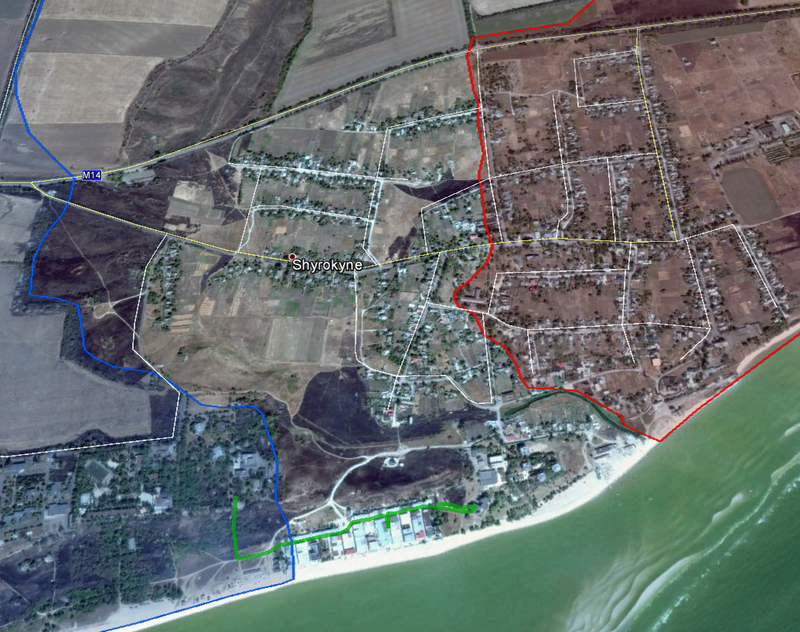 While the front between Ukrainian and Russian troops seems quite stable during the last weeks, several solid indication points at an escalation during the coming weeks with one main hot spot seeming to be the area East of the coastal hub Mariupol, namely the village of Shyrokyne. Regarding the Russian side, there have been a number of attacks on the Ukrainian fortifications on the Western outskirts of the village over the last weeks, sometimes more, sometimes less intense. Five days ago, the so far heaviest artillery attack took place, not only on the Ukrainian line of defense in Shyrokyne, but also on the villages located behind, namely Berdyanske and Sopyne. The attack on March 31 included the notorious 2S1 “Gvozdika”, a self-propelled artillery piece, which held and important and finally decisive share in the attack on the Ukrainian line around Debaltseve in February. The below map shows which locations were hit, based on geolocated video footage of the attack. However, this attack was rather an exception, testing the Ukrainian reaction. Beside that, most attacks over the last weeks were conducted by small arms, grenade launchers and 82 as well as 120 mm mortars. The number of tanks and apcs involved whereas was quite manageable, never exceeding 2 or 3. However, this might change shortly. The OSCE is active in the area, reporting military activities from both sides. In its yesterday report it stated that it launched a drone in the area on April 3, two days ago, witnessing an extraordinary buildup in Russian military hardware. 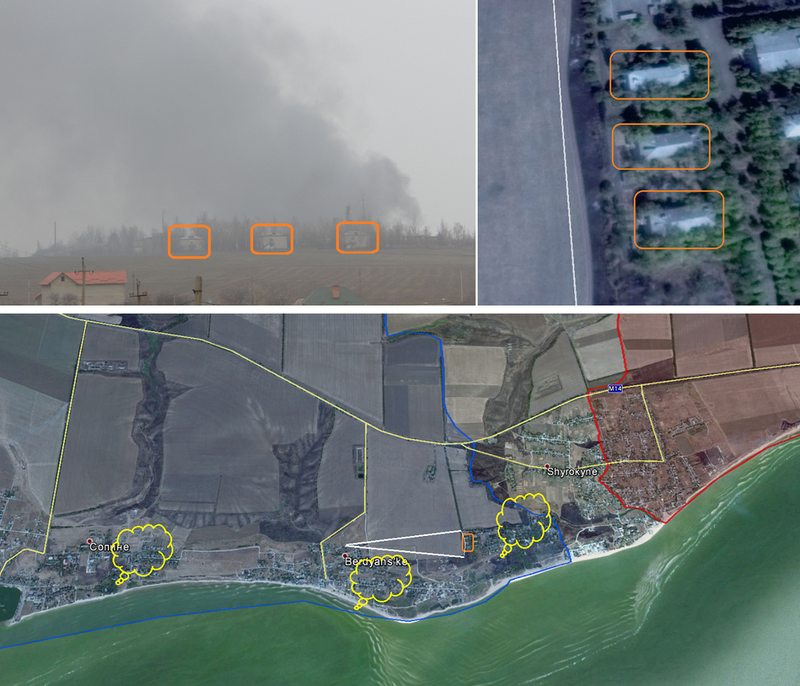 From analyzed drone footage it concluded that no less than 15 Russian main battle tanks – supposedly T-64 and T-72 are stationed “in areas around Shyrokyne”, indicating a large-scale attack is planned during the coming days or weeks. It is worth mentioning, that the same drone only observed one Ukrainian armored personal carrier near Shyrokyne. While Ukrainian forces from Regiment Azov are known to have several T-64B1M located at the second line of defense in Berdyanske, their number should not exceed 2-5. Given the fact, that the OSCE’s drones have a relative short operational range, it must be concluded that the Russian offensive power in the area exceeds Ukraine’s defensive capacities by a multiple. Especially knowing, that larger-caliber weapons like Grad missile launchers and heavy artillery is pulled far back behind Mariupol at the moment. Looking at the Ukrainian side, some interesting as worrying developments could be seen during the last 48 hours. There is no doubt that Ukraine’s regular army proved in several cases (/battles) over the last months that is is either not able or – rather – not allowed to battle the Russian invasion force with the necessary endurance and – yes – harshness to inflict enough damage to stop or at least significantly slow its Western advance. This is no critique to the troops, fighting on the ground, but to the officers and especially general staff, giving dubious orders to say the least. At the same time, (partly former) volunteer troops from the “Battalion Donbas”, “Regiment Azov”, “Pravy Sector” and others turned out to be much more persistent and free in their decisions to use tactics and means to hold back the Russian aggressors in meaningful ways. Thus, it is no miracle that those troops hold several sectors of the front, including the one East of Mariupol and along the Kalmius river northwards. However, these troops seem to have been reinforced by even more remarkable or rather irregular forces, more specifically foreign fighters from Chechnya and the Chechen diaspora in Europe, willing to settle outstanding scores from earlier wars with Russia. Pullout of all foreign armed formations, military equipment, and also mercenaries from the territory of Ukraine under OSCE supervision. However, the RUSSIAN side is the last that should start complaining about that treaty violation. 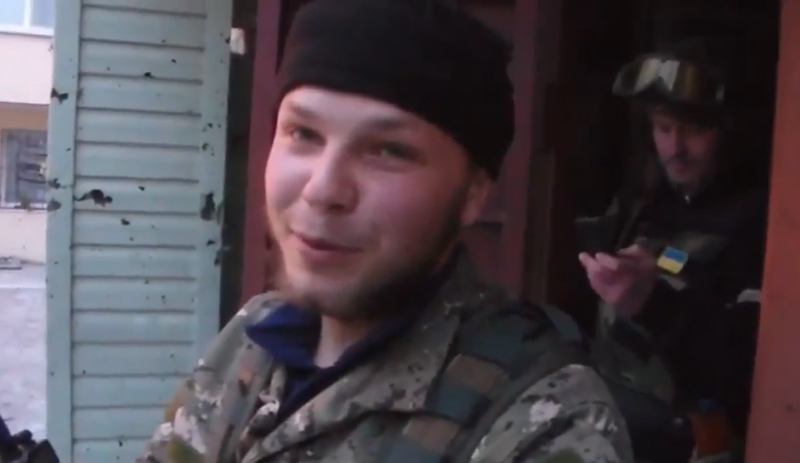 Video footage shows the Chechen fighters, being on the very front between Russian and Ukrainian forces in Shyrokyne. They are not only defending the Ukrainian fortifications, but conducting commando raids deep into the embattled town, looking for direct battle contact with Russian troops in the area. Geolocation of their uploaded footage allows to get some insight into their advance (see map below, green line is the way they took). 1. The Russian invasion army obviously drew its former – and still – enemies with it into Ukraine, which could add to its troubles on the territory of its Western neighbor. Chechen forces created hell for Russian invaders back in the 1990s and the mere shout of “Allah hu akbar” in the streets of Shyrokyne has the potential to frighten them a lot and change things on the ground from a psychological point of view. 2. The Ukrainian leadership obviously has chosen to allow proxies to do what it is officially not willing to do, namely to provoke the Russian side by inflicting damage on it due to offensive operation. Back in February, it was Regiment Azov that was allowed to advance in the south, while the Ukrainian leadership was in active negotiations with Europe and Russia to calm down the conflict. Also then, it looked like the government was searching for a way to not totally surrender while complying with the Minsk 1 and later Minsk 2 treaties. Regiment Azov was the best way to do so as it still has a semi-autonomous leadership within the Ukrainian national guard command structure and Kiev can claim to be “not fully responsible” for its actions. 3. The cooperation of Azov forces and Chechen Islamic fighters can be seen as a myth buster insofar that it shows, prejudices towards the two groups and possibly towards each other don’t apply against the backdrop of a common enemy. The “fascists” – or rather nationalists – from Regiment Azov seem to have no problem with fighting side by side with foreign Muslims when there is enough reason to do so. On the other side, the – at least partially – former IS members from Chechnya seem to have no problem to fight with Christians and alleged “nationalist xenophobics” from a European country. The below picture shows a Chechen fighter in the foreground and an Ukrainian trooper – probably from a National Guard unit (Donbas or Azov) in the background, getting ready for battle. In conclusion, there seem to be steady steps of escalation from both sides, expecting armed confrontation to flare up during the spring. Russia has concentrated enough forces in the area to pierce the Ukrainian line of defense and return to the city limits of Mariupol. It has demonstrated more than once during the last 6 weeks that it does not regard its signature under the Minsk 2 treaty as limiting its territorial aspirations in Eastern Ukraine and especially along the Azov Sea cost. At the same time, Ukraine seems to have finally noticed that there cannot be any trust in the Russian side, especially after the fall of Debaltseve after the signing of the Minsk 2 agreement. Hence, it has decided to deploy fighters to the front area, willing and able to harm Russian troops. By sending foreign “volunteers” to the front that are raiding Russian positions beyond “firing back” after ceasefire violations, it has chosen to provoke the Russian side. A provocation that is far smaller than firing mortars and other weapons over the demarcation line daily, but still a provocation that will be regarded as a “gross violation of the Minsk protocol” by the hypersensitive Russian side, just waiting for things like that to happen to justify further escalation. Ukraine knows that and seems willing to pay that price to keep its face in the light of daily Russian attacks on its troops, which have killed Ukrainian 9 soldiers during the last 48 hours alone. This entry was posted in Ukraine and tagged Chechen Fighters, Donbas, Mariupol, Russia, Shyrokyne, Ukraine by Julian Röpcke. Bookmark the permalink. Seriously– ‘“Allah hu akbar” in the streets of Shyrokyne’ will scare Russians!!!? Not even Chechens believe THAT! Maybe you should ask the thousands of Russian troops that died in and around Grozny. I’m beyond that nonsense discussion since July last year. End of it. I wonder how long before the western governments, the US mainly decide to openly arm the Ukrainian military which would cause considerable alarm in Russia because can you imagine 20 to 30 Russian and five or six time that wounded dead a day plus an ever increasing array of sanctions will do to the average Russians psyche.